Since independence from Ethiopia in 1993, Eritrea has faced the economic problems of a small, desperately poor country, accentuated by the recent implementation of restrictive economic policies. Eritrea has a command economy under the control of the sole political party, the People's Front for Democracy and Justice (PFDJ). Like the economies of many African nations, a large share of the population - nearly 80% - is engaged in subsistence agriculture, but they produce only a small share of total output. Since the conclusion of the Ethiopian-Eritrea war in 2000, the government has maintained a firm grip on the economy, expanding the use of the military and party-owned businesses to complete Eritrea's development agenda. The government strictly controls the use of foreign currency by limiting access and availability. Few private enterprises remain in Eritrea. 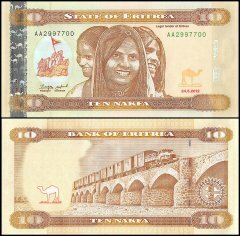 Eritrea's economy depends heavily on taxes paid by members of the diaspora. Erratic rainfall and the delayed demobilization of agriculturalists from the military continue to interfere with agricultural production, and Eritrea's recent harvests have been unable to meet the food needs of the country. The Government continues to place its hope for additional revenue on the development of several international mining projects. Despite difficulties for international companies in working with the Eritrean Government, a Canadian mining company signed a contract with the government in 2007 and began mineral extraction in 2010. Eritrea's economic future depends upon its ability to master social problems such as illiteracy, unemployment, and low skills, and more importantly, on the government's willingness to support a true market economy.